It was snack time in the Triangle household the other day. Tabitha decided she wanted crackers with pepperoni and cheese, baked briefly in the oven. She asked for eight. I was skeptical that she was that hungry. I was worried about wasted food. I asked her about this. Tabitha (five years old): I promise to eat a little bit out of each cracker. Me: Wait. Say that again. T: I’ll eat some of the crackers, and the ones I don’t want to eat all of, I’ll eat some out of each one. Me: So you want eight, and you’re not promising to eat all of them, but you’re promising to eat part of each one? I relented. And I got out the baking sheet and 8 crackers. Me: Can you put those crackers out in nice rows? T: What kind of rows? Three of three? 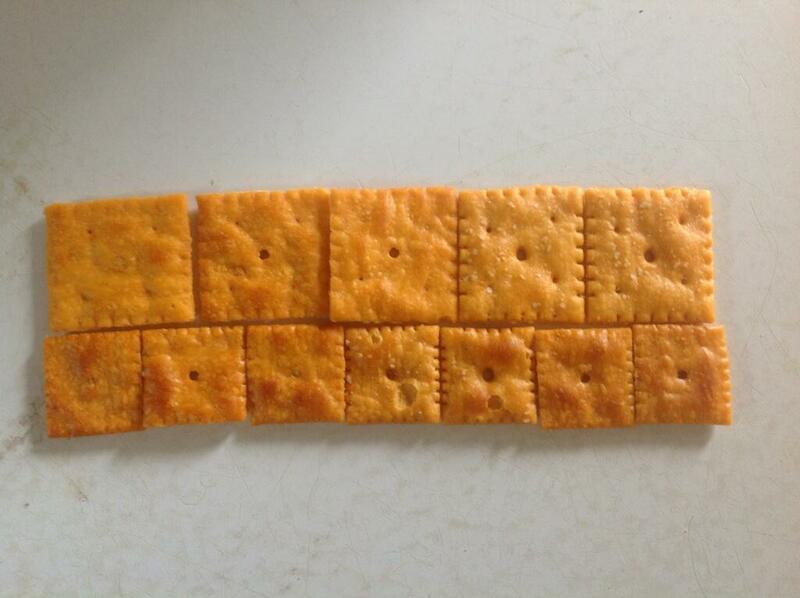 As we’ll see shortly, she was meaning to ask how long each row should be—should each row have three crackers? She did not seem to be asking also about the number of rows. Although I didn’t know that yet and was prepared to be dumbfounded. Me: Whatever you can do. You choose. 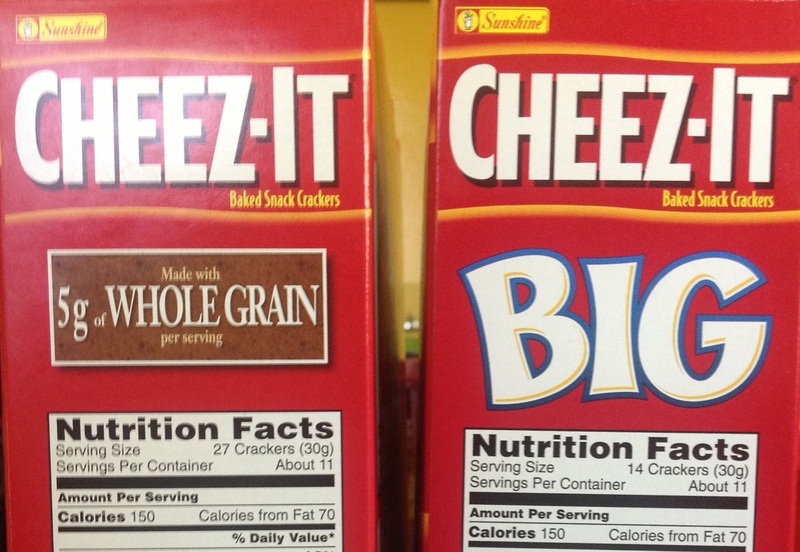 Make them the same size, though. T: I made three rows and there’s two left. I can’t do it. Me: Oh. So what are you gonna do instead? That is, she is going to make rows of two, since rows of three didn’t work. She worked busily at this for about a minute, chatting to herself about her work. Me: Now. How many pieces of pepperoni do you need? T: Cause there’s eight crackers. T: But first you need the cheese. Me: No! It’s pepperoni and then cheese goes on top. I cannot explain my need to adhere to this principle. But I do stand by it. Me: Here you go. Here’s ten pieces of pepperoni. Me: Are there gonna be any leftovers after you put them on there? T: No. I’ll put two on two. Here, she means to say that she will put two pieces of pepperoni on each cracker. Again, I am prepared to be amazed. 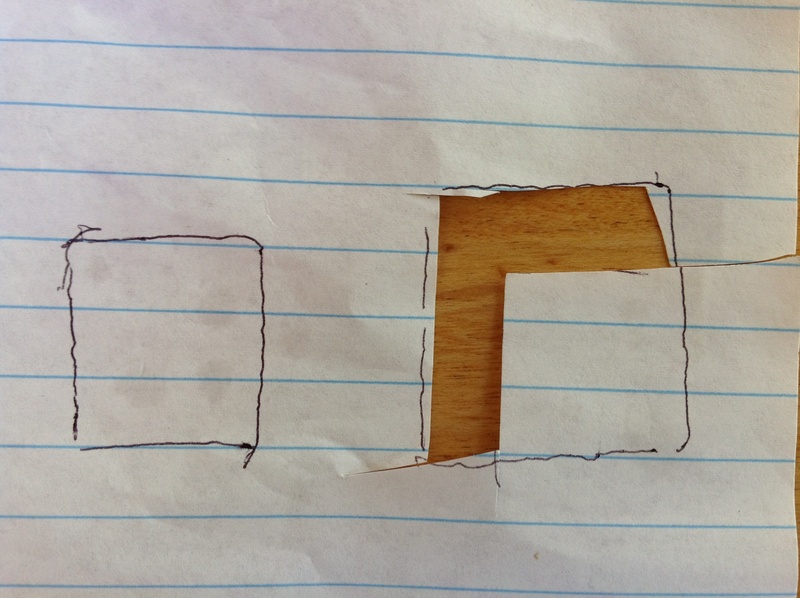 I am thinking that she might mean that she’ll put two pieces on two crackers, and one piece on the others. She does not mean this. Me: Show me. I don’t get it. She proceeds to put two pieces of pepperoni on each of the first few crackers. The result is one of the funniest things she has seen in days. Me: Keep going. I want to see how this works out. T: But if there are, I’ll eat them…This is funny, isn’t it? 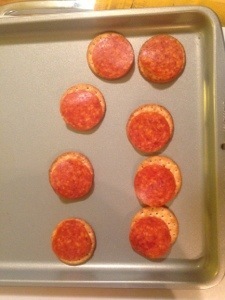 Putting two pieces of pepperoni on each one? Me: You gonna have enough? T: Uh oh. No, no, no. Different idea. I need eight, sorry. I did two and I only had three left. I mean I had two left. This is pretty difficult to parse if you were not there. She has covered one of two columns of four crackers with two pieces of pepperoni each. This leaves her with two pieces of pepperoni in her hand, which she notices is inadequate for doing the same to the remaining column. Me: So you need eight exactly? T: And there’s a whole row left! As a developing authority on the topic of one, I would like to point out the various units Tabitha is keeping track of in this work. She is counting (1) crackers, (2) pieces of pepperoni, (3) the number of pieces of pepperoni per cracker (a unit rate), (4) the number of crackers in each row (another unit rate), and (5) the number of rows of crackers. This is cognitively complex stuff. T: Oh! I’ll put eight…I’ll put one on each one and then eat the rest…and then eat the leftovers. Me: How many leftovers are there gonna be? T: Oh. I don’t know. Oh. I have an idea. She removes the pepperoni pieces from the crackers, stacks them and counts in a whisper. T: Ten…I mean no! One! I mean two! Two. T: I can eat two. Me: See if this works out. Tabitha proceeds to match the crackers with pepperoni slices. 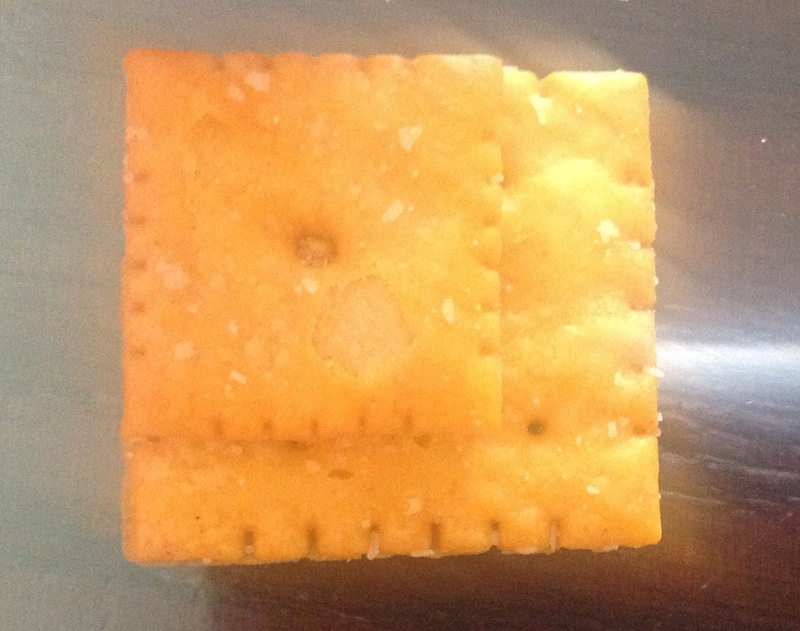 T: Why don’t they call this cheese-pepperoni crackers? Me: We could call them cheese-pepperoni crackers. T: It’s cheese and crackers if there’s no pepperoni, so it should be called cheese-pepperoni crackers. T: I was right, two! Look. There’s two left. Me: What are you gonna do with them? She shoves both in her mouth dramatically and laughs. And here is the result; ready for cheese and then the oven.